It seems that each year, more people try to deny the secular role that Christmas plays in our society. Every time a company decides that "Happy Holidays" is somehow less offensive than "Merry Christmas," that's a loss. There are two holidays that happen to have the same name and fall at the same time: one is about Jesus being born in a manger, the other is about Santa and decorated trees. It's not like anyone still thinks of Halloween as a religious thing. Oh, wait, some devout people do? Hey, more power to them. In any case, you'd be hard-pressed to find any religious connections with Sam the Snowman. He's overtly seasonal. Flagrantly non-denominational. About as inoffensive as inoffensive gets. He's the jolly narrator of the Rankin/Bass Rudolph the Red-Nosed Reindeer special. Though his role as narrator may also cast him as God, there's nothing to say which God he is. Sam comes to us from Playing Mantis, one of the many companies that has disappeared from the industry in the last few years. Playing Mantis carved its niche by trying to appeal to the nostalgia market, but they aimed further back than most: their biggest lines were the Rankin/Bass tv specials, Peanuts and Johnny Lightning die-cast cars. In 2005, PM was purchased by RC2 Corporation, the same people who own Joyride Studios - yes, they of the Halo toys - and Ertl, the toy tractor people. The figure's sculpt is really nice. It's not 100% accurate to the tv show, but it's damn close. 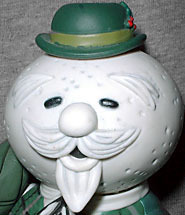 Sam is a standard three-ball snowman, which must make it hard for him to walk. You know, 'cause he's got no legs. The body balls are the same general size, while the head is slightly smaller. 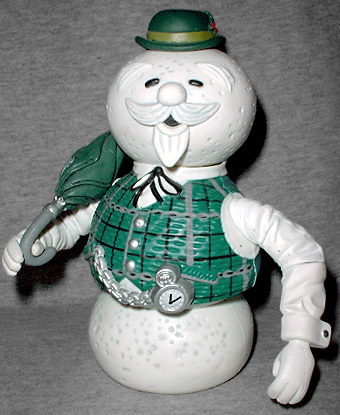 The "dimples" on the snow are sculpted in, as is the texture on his vest and even the hands of his watch. Sam wasn't in the original Rudolph script - all his dialogue and songs were intended (and even recorded) for Yukon Cornelius. 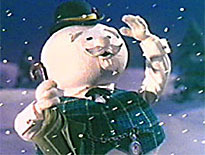 But NBC and GE decided that they needed a big-name star to help carry the show, and so got folk singer Burl Ives to portray the portly ice golem. Worked out pretty well for him, too: the song "Holly Jolly Christmas," which was written specifically for the special, went on to be a pretty big hit and is considered a holiday standard today. It also started a trend of big-name stars appearing in these silly little Rankin/Bass cartoons. The paint is good, for such a simple toy. 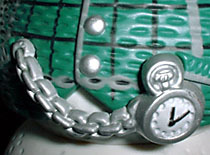 The dimples are painted, there's a wash on his "hair" and his watch is silver. His vest is a nice plaid, and the sprig of holly on his hat band has three dark red berries. Sam has two accessories: his hat, which plugs into his head to keep it in place, and his green umbrella, which he can sling over his shoulder. Sam is 4½" tall, not counting his hat, and moves at the wrists, elbows, shoulders, waist and neck. Playing Mantis's Rankin/Bass figures did pretty well for their time, but it wasn't enough to keep the company afloat forever. You can now find the Rudolph figures in your local CVS at dirt-cheap prices, for instance. Sam the Snowman is a cool figure, no pun intended, and now that you should be able to find him at a reasonable price, it's worth tracking down this Christmas icon. Mozel tov!